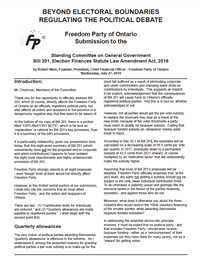 On July 27, 2016, Freedom Party of Ontario’s president and Chief Financial Officer, Robert Metz, testified at the London hearing of the Standing Committee on General Government in respect of Bill 201 (the Election Finances Statute Law Amendment Act, 2016). Among other things, the bill would place reduced limits on financial contributions to political parties, and provide larger parties (but not all parties) with a per-vote subsidy. The Committee allowed Robert Metz only 10 minutes in which to make his oral submissions. Accordingly, this entry includes links both to Metz’s oral (i.e., spoken) submissions, and to the written submissions (complete with enclosures) that were provided to the Committee on behalf of Freedom Party of Ontario. 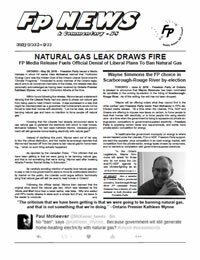 FPO’s written submissions included four enclosures: two FPO issue papers (“Politics is Personal” [v. 2] and “About Freedom Party” [v. 2]), FPO’s “Multiply…or Divide?” pamphlet, and FPO’s “All About Ontario’s Political Tax Credits and Freedom Party” pamphlet.